It's the perfect time to gather together and spend some time in the kitchen and learning some smokey grilling skills from our chef as you corral the kids into creating something special together! 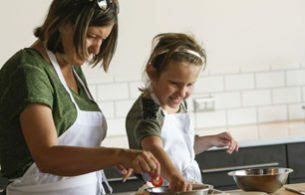 Make fun memories and a great meal as you work together to make a variety of delicious grilled eats during this event. *Price is per attendee. Children/Youth must be 6-17 years old and attend with an adult. Please purchase 1 seat per person. Rather than just going out to brunch, join us for this special family day out and bring the family together through the creation of a delectable meal.